At 4.00am I have to get up and go to the loo. This might mot be of great interest to you, but I mention it because when you have to walk outside in the dark without a soul around, the possibility of coming face to face with a bear suddenly seems very real. The way I look at 4.00am would probably frighten a bear silly. We are all up at 6.15am and get ready to catch the Valley Shuttle to Yosemite Lodge. Here we transfer for a one-way bus ride to Glacier Point where we are going to hike back down into the valley. We had planned to do the 4-mile trail, but I have been talking to a man in the cabin opposite us. He has returned to Yosemite and stayed in the same cabin every year for the past 10 years, so he should know his stuff. 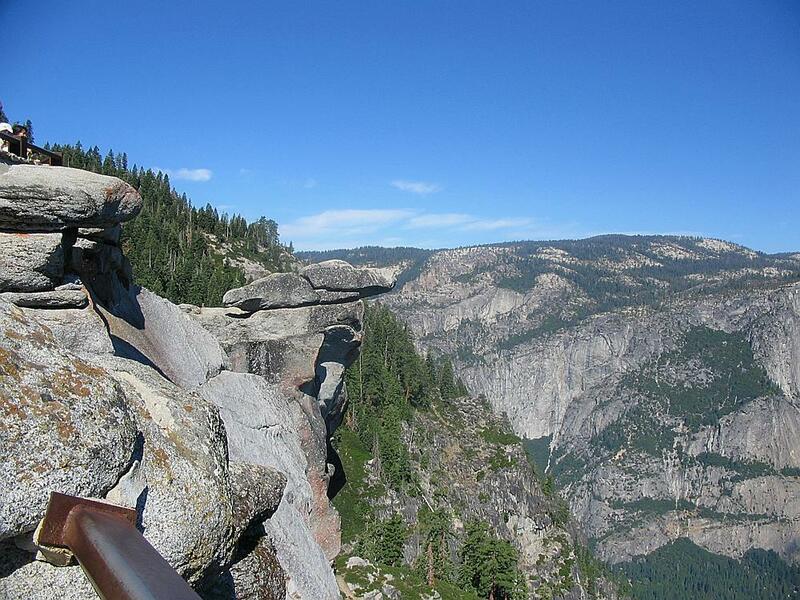 He tells me that the 4-mile trail is pretty much a winding path straight down from Glacier Point with not much to see. 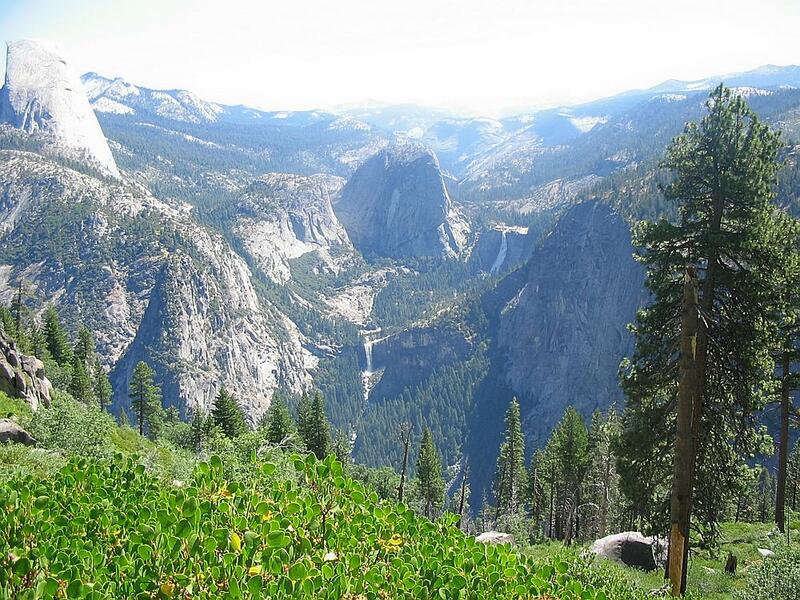 He advises us to take the Panorama Trail, which is 8 ½ miles long, but takes in Illilouette Falls, Nevada Falls and Vernal Falls. We have decided to take his advice and go for the longer hike. The lady driving the bus up to Glacier Point is obviously in love with Yosemite and her enthusiasm makes the information she imparts very interesting. Apparently, El Capitan is 3 times taller than the Empire State Building and Half Dome stands 1 mile above the valley floor. As we climb higher and higher she tells us of devastating fires and what happens when huge slabs of rock fall from the cliff walls. She says that a recent fall dropped a rock twice the size of a football field that registered 1.4 on the Richter scale. It threw up a dust cloud that grew to 200 feet above the valley walls. Thats a dust cloud over a mile high! We are talking about nature on a different scale here. As we drive along there are some cars parked at the edge of a meadow. Our driver tells us that when cars are parked in such a haphazard fashion it is usually because a bear has been spotted. Sure enough, over the far side of the meadow, we see it. The bus stops and we all pile off to take photos under strict instructions not to enter the meadow. Tam is ecstatic; she has been desperate to see a bear. We watch for a few minutes before he lumbers off into the woods. It may be small and it may be a long way off, but it's a bear, ok? 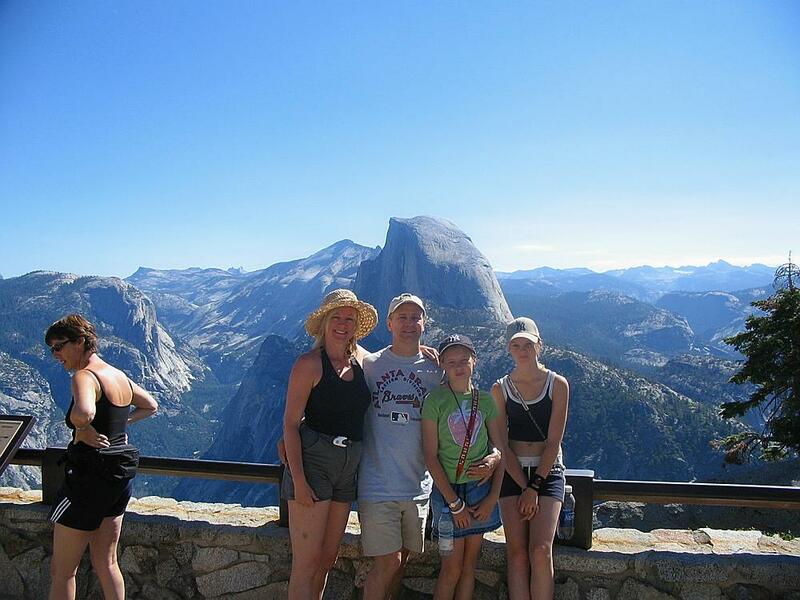 We disembark at Glacier Point and walk over to the overlook. I know I have enthused about many sights on this holiday, but I defy anybody not to have their breath taken away by what we see. 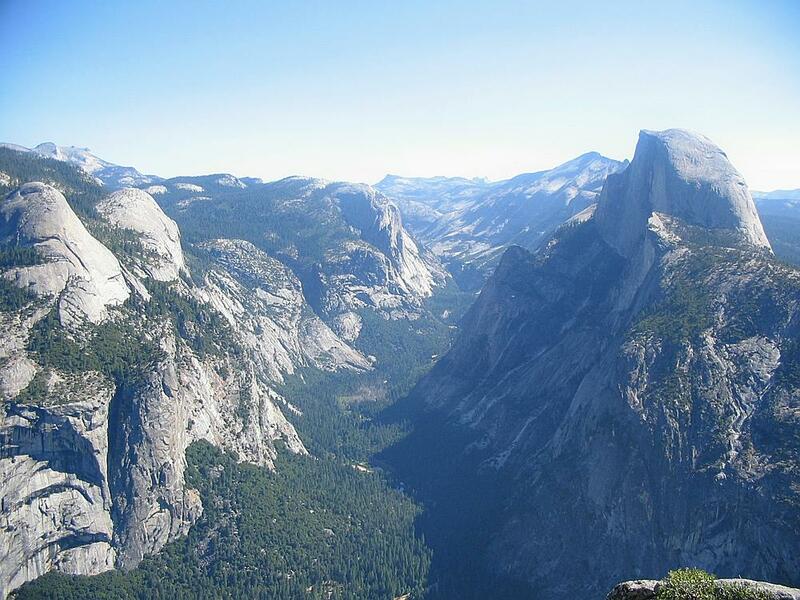 The view across Yosemite Valley and beyond to the High Sierras is one of the greatest in the world. I remember taking Geography at school and being bored most of the time. They should bring every schoolchild here to see the end result of glacial action. 1 mile deep, 1 mile across and 7 ½ miles long, the entire valley has been scored out of the planets surface by a slowly moving sheet of ice. In some places, such as Half Dome, entire mountains have been sheared in half leaving vertical faces hundreds of feet high. Who's the sad tart with the shorts on that crept into the picture? Wait a minute, it's me! As you lean over the railing you can see Curry camp below you. ¾ of a mile below you. No trees, no overhanging rocks, if you dropped a stone off here it wouldnt stop falling for ¾ of a mile. You could stay here all day just looking at the views. I've seen photos on the net of people stood out on the edge of this rock. Let's face it, you've got to be a sandwich or two short of a bears picnic hamper to try that. From here you can see both Nevada and Vernal Falls. Look tame from this distance, don't they? There is an information point that says there used to be a hotel here many years ago until it burnt down. What a place to stay! Still, weve got some walking to do! We set off along the trail and the first mile and a half is all downhill to Illilouette Falls. By Yosemite standards this isnt the biggest, but its still taller than any waterfall Ive ever seen in the UK. The upper rock pools provide a perfect place to cool the feet before proceeding along the trail. The next section is the most strenuous as it is mostly uphill, but provides some stunning views down through the valley. Next is Nevada Falls. You tend to hear these monsters long before you see them. Its incredible how close to the edge of the falls you can get. Just a rusty (yet sturdy) metal fence keeps you from a fall of hundreds of feet; you can almost touch the water. 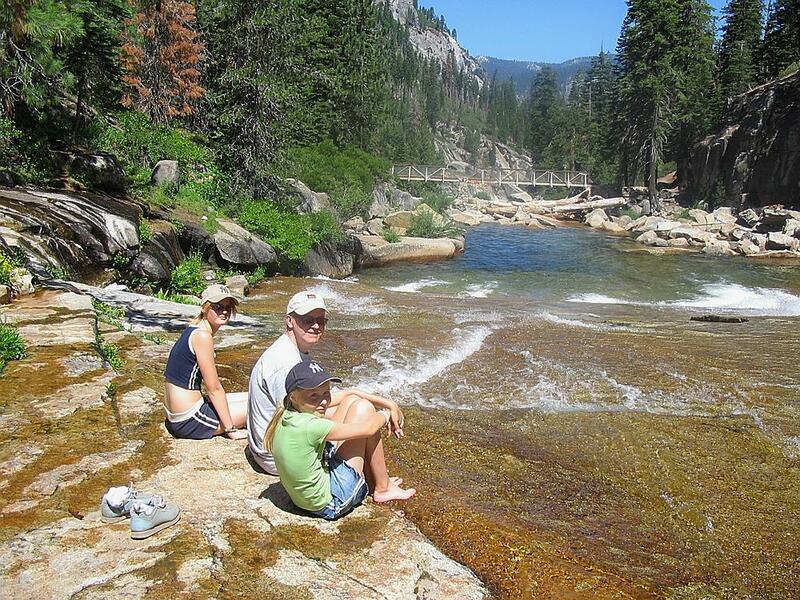 We wander back upstream a bit to the rock pools to cool off and have lunch. 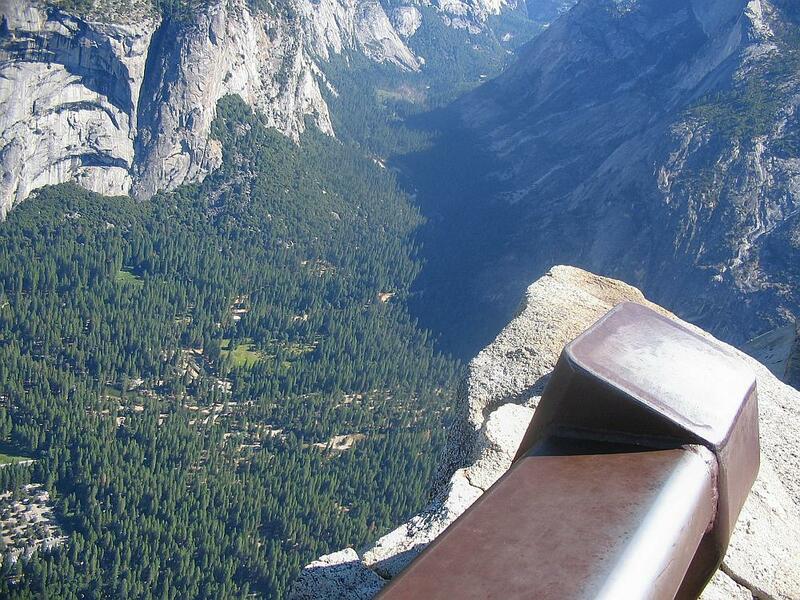 Tam had the forethought to buy a few rolls at Glacier Point. This is washed down with water from bottles that have been immersed in the flowing waters of the river to cool down. It might not exactly be a feast fit for a king, but it sure tastes good in the circumstances. Feet and then heads are dunked into the cold flowing water to prepare for the next leg of our journey. This takes us down to Vernal Falls. Some parts of the trail have little or no protection from a fall that would produce certain death, but you rarely feel in any danger. 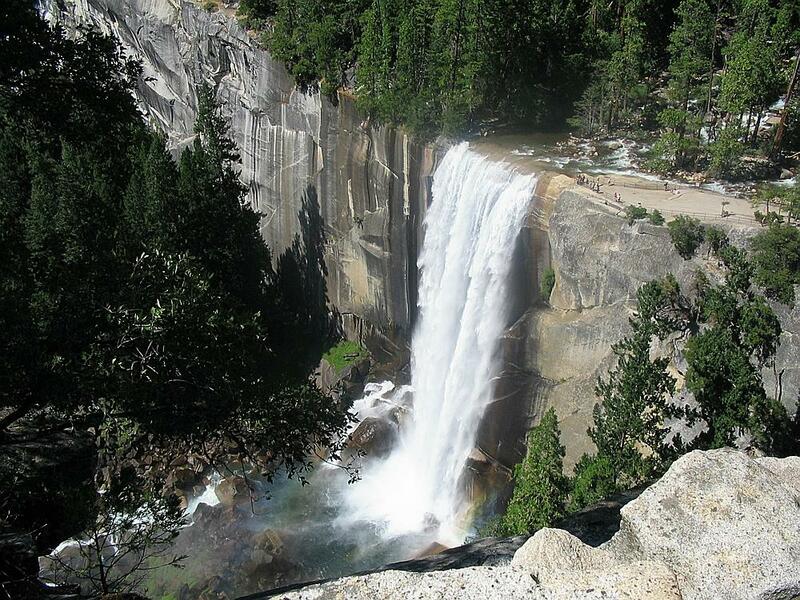 We continue on down from Vernal Falls once again mastering the 700 steps. Funny, it didnt seem as long when we did this bit yesterday. Our water ran out a couple of hours ago and we are all desperate to reach the footbridge at the bottom of the falls where we know there is a water station. We arrive and guzzle gallons and pour just as much over our heads. As Georgia says, she never thought she would enjoy water so much. Just another mile to cover and we arrive back at the shuttle bus stop at 4.30pm. 6 hours of walking. 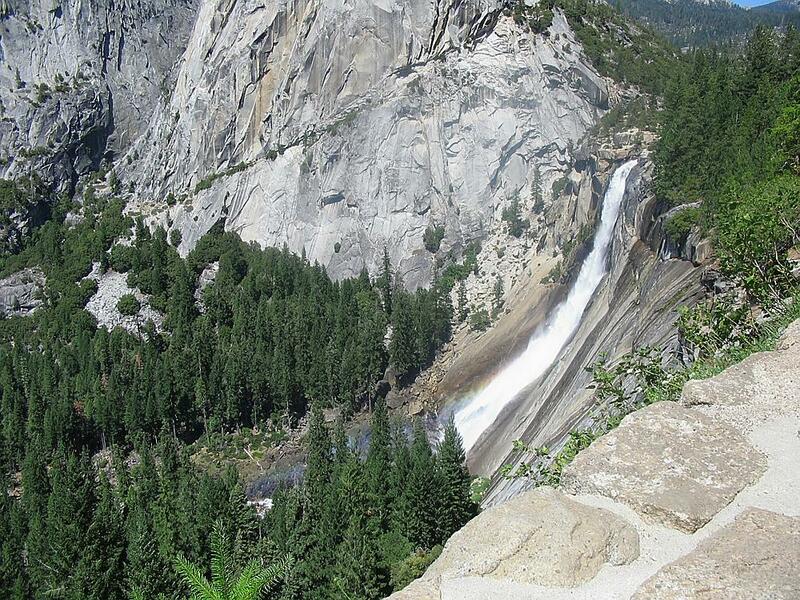 I estimate that, with the slight detour to the top of Nevada Falls, we have covered about 9 miles. This might not seem a great distance, but much of it is either uphill or downhill and over some quite strenuous stretches. All of us are tired, but the girls have been fantastic. There have been a few moans and groans along the way, but mostly they have enjoyed it. As I say to India, she will forget the pain and the tiredness, but she will never forget the magnificent sights she has seen. We get the bus for the short trip back to Curry Camp. 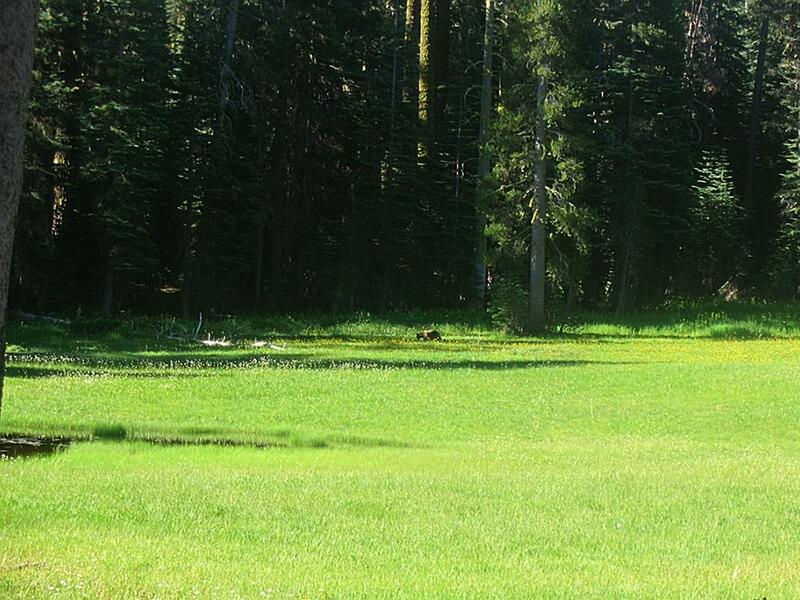 As we exit the bus there is a large deer grazing in the meadow. Back to the hut and we are all desperately keen to jump in the swimming pool. Unfortunately it is shut. It appears that they havent got enough lifeguards available. A black mark Curry Camp, guest satisfaction slightly reduced. Instead we retire to the terrace in front of the pizza place for a beer and to write up the trip report. Showers are next. India has gone on up to the shower block a while ago, but Tam, me and Georgia walk up together. The womens block has a queue of 30 ladies waiting for 7 stalls! I enter the mens block and there are 2 men waiting. We start talking and agree that its because men are much more efficient when showering. At this point a shower door opens and 2 young women come out giggling. We men look at each other and we all know exactly what the others are thinking. Why couldnt we be in THAT cubicle? The queue for the womens shower is just silly, so the American guy next to me fetches his wife and child from the ladies line so they can all shower together. At this point I should mention that all the cubicles have a lock on the door, a shower and a separate small changing area, so everything is private. Tam pokes her head round the door to see whats happening and I tell her to bring Georgia and we will all shower together. Its a bit of a squash, but we manage it. I am so tempted to exit the cubicle, wink at the next guy in line and say That was fun. Never seen her before. Tam and Georgia leave the shower block and I stay to shave. There is nearly a diplomatic incident as there is a lady waiting with her husband and family when another guy says to her You girls shouldnt be in the mens shower room. When the lady points out that there is a huge queue for the womens showers and that the cubicles are private, he says You should have more respect for yourself. Pardon me? Respect? In a time of war, famine and terrorism, I hardly feel that an unlikely flash of a mans dangly bits is likely to completely ruin this ladys self-respect. Still, black mark number 2 for Curry Camp. At 7.00pm we get the Village Shuttle to the village. Where else would you get the Village Shuttle to? There is very little choice of dining establishments here. In fact, after 5.00pm, you eat at Degnans Loft or you dont eat at all. This is another place that does mostly pizza with a few other odds and ends. With the exception of Georgia, we are all pizzad out, so we choose other menu items. Theres nothing wrong with the food so we tuck into Caesar salad, lasagne, chicken wings and pizza sandwich. Its just the finer dining experiences that are missing, although you can eat at the restaurants at the Ahwahnee Hotel or the Yosemite Lodge. The shuttle bus takes us back to Curry Camp where another beer is in order while the girls play cards with Jordan and some of his friends. I havent got a clue whats going on as it seems to involve all sorts of rules such as shouting Boo at the appropriate moment and getting extra cards for talking. Its all too much for my poor old brain, so its off to bed at 11.00pm.